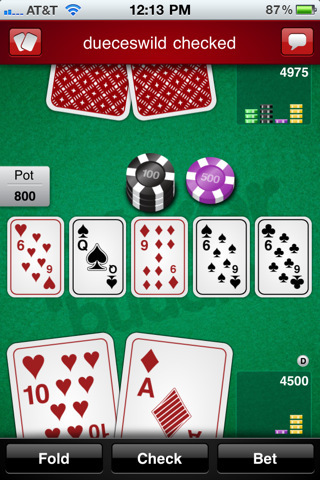 Poker Buddies App: Extremely Addictive iPod Touch Application. Brilliant poker players always want a worthy opponent. Skilled poker players completely understand the technical science and strategy involved whenever they play. It is often in how they play the person or opponent. In order to become an effective poker player, you have to have the patience, skill, knowledge, and the strategy to really win. In an ordinary poker game, you just win or lose. But in Poker Buddies ipod touch app, you get to win prizes, too. There is this heads-up game that you could play with family and friends. There are several instant prize-winning games and monthly draws for much larger items to win. What’s Poker Buddies App All About? First, you have to create your account so that you could hold your own identity throughout each Poker Buddies ipod touch game. Then, you could continue by adding friends to your list. It would be faster and more thrilling if you just choose randomly. When it is your turn to play, you will be given a push notification. You also have the option to go online and play with the similar interface that you use in the application itself. Here, you could branch out and learn more strategies about poker. Poker Buddies App for ipod touch, iphone and ipad is a very addictive game, especially if you are one poker player who doesn’t want to lose. This leads to another fun game—“watch your battery die” or “when to charge up”. This is one of those iOS games that you definitely won’t give up that easily. To win instant prizes, you have to have high points first in Poker Buddies App. In monthly draws, you only have a small chance at getting the prized item. This is generally a very well-thought of application. You have a slider in choosing the amount. The slider is not that advantageous because it slides a bit when you use it. Maybe a spinner or a numerical entry box would be a better option for placing bets accurately. Another thing to deal with is the inability to exit when you already tapped the button to “raise”. There is absolutely no turning back on this one. If you don’t think of it carefully first, you might end up getting bankrupt. Poker Buddies ipod touch app is definitely a great way to pass the time and impress other poker addicts. It is also a very good way to meet other poker enthusiasts and more friends. This application is free of charge but you could still win prizes! There is nothing to lose! All you have to do is play! Just make sure that you are ready to charge up whenever you start playing Poker Buddies. You could get this Poker Buddies App in iTunes App store here. Apple has a very strange policy in terms of helping clients recover their stolen iPhones!